DAMASCUS, SYRIA (5:30 P.M.) – The Syrian Arab Army (SAA) is on the march through the countryside of eastern Aleppo, liberating village after village from the Islamic State’s collapsing forces. In a bid to surround Jirah Airbase for an upcoming assault, the SAA’s Tiger Forces took full control of Jubb Madi and Zarkieh on Tuesday following the liberation of two nearby villages yesterday. Hundreds of ISIS militants have reportedly left Aleppo province over the past week in order to deal with an urgent situation around Tabqa city where Kurdish forces are increasingly active. Meanwhile, the SAA is yet to conclude its demining work at the highly booby-trapped city of Deir Hafer, preventing civilians from returning to the former ISIS bastion. Once the Islamic State is completely expelled from rural Aleppo, the SAA may join forces with the Kurdish-led Syrian Democratic Forces in an offensive towards the provincial capital of Raqqa, the self-proclaimed Islamic State capital. 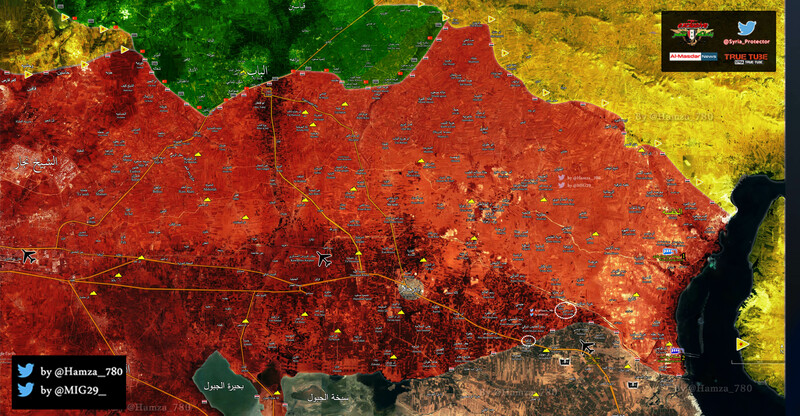 Click here for a high-resolution map of eastern Aleppo. El ejercito Sirio podría lanzar una ofensiva desde el sur para alcanzar Al-Tabqa, podría ser una laternativa para cortar los intereses de EE.UU..
El ejercito Sirio podría Lanzar Una Ofensiva Desde el sur para Alcanzar Al-Tabqa, Ser podría Una alternativa párrafo Cortar Los intereses de EE.UU ..